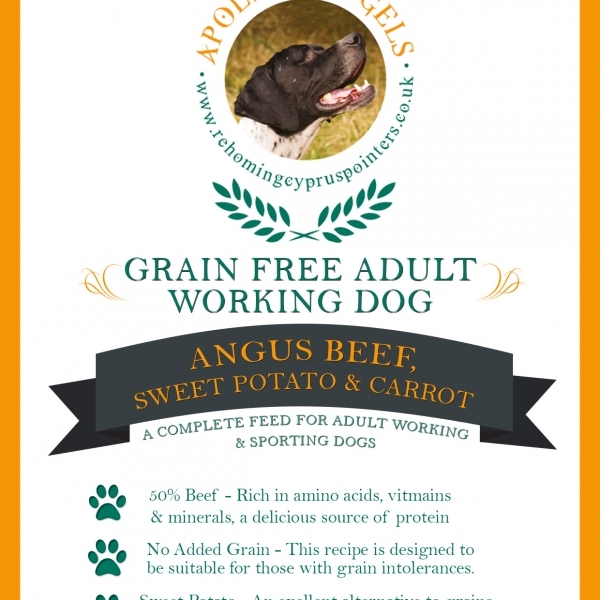 Apollo’s Angels Grain Free Angus Beef with Sweet Potato and Carrot is a complete, balanced and hypoallergenic pet food for adult dogs. Grain Free recipe dog foods are an excellent choice for dogs with grain intolerance or sensitivity. High proportion of freshly prepared meat. 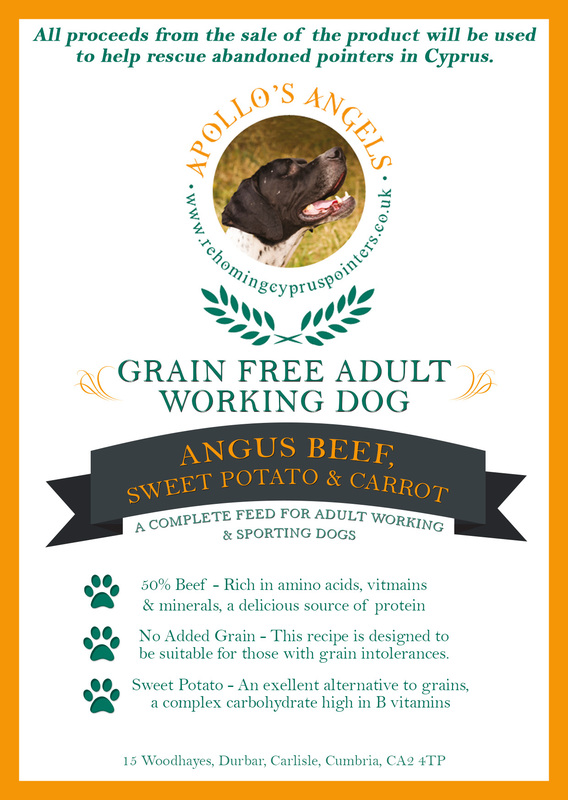 Apollo’s Angels Grain Free Angus Beef With Sweet Potato & Carrot is a complete, balanced and hypoallergenic pet food for adult dogs. Beef is a highly digestible source of protein, rich in amino acids, vitamins and minerals. Grain Free recipe dog foods are an excellent choice for dogs with grain intolerance or sensitivity. Apollo’s Angels Grain Free Pet foods contain a high proportion of freshly prepared meat. This is a very important distinction from other pet foods on the market and the latest major step forward in pet food production. Due to the varying moisture content of fresh meats, pet food manufacturers have found it difficult to produce a consistent dry food product using fresh meat. We now use the latest technology to gently remove moisture at very low temperatures. The result is beautifully cooked dry pet food with the flavour and nutritional values retained. Due to this better nutrition you don’t need to feed as much. No meat derivatives. Unlike lesser quality pet foods, this pet food only uses quality meat, no meat derivatives, beaks, feathers or anything else you wouldn’t recognise as meat. Single source protein. While many pet foods use animal protein from mixed sources, this food uses only a single source. If you pet is sensitive to a particular meat, you can be confident that this recipe only contains the meat stated in the title. This vet approved recipe is naturally gentle on a dogs digestive system. Freshly prepared Angus Beef is formulated with sweet potato and carrot. No artificial colours or preservatives are added. Sweet potato is nutritionally quite different from the common potato. It contains much more fibre, it is a fantastic source of vitamin A, and is also rich in vitamins C and B6 and several other beneficial minerals. This deluxe recipe pet food has a very high meat content with 50% Angus Beef. Apollo’s Angels Grain Free Angus Beef With Sweet Potato & Carrot also benefits from an added Omega 3 supplement along with a premium vitamins and minerals package. Apollo’s Angels Grain Free Pet Range has been developed and created at one of the most technologically advanced and best equipped dry pet food manufacturing facilities anywhere in the world. Beef 50% (including 28% freshly prepared Angus beef, 19% dried beef & 3% beef fat), Sweet Potato 26%, Peas, Potato 9%, Beet Pulp, Linseed, Omega 3 supplement, Vitamins & Minerals, Vegetable stock, Carrot (equivalent to 7.5g per kg), FOS (92mg/kg), MOS (23mg/kg). A nutritious, tasty, complete diet for the older dog, it is also suitable for dogs requiring a weight loss programme. Added Glucosamine, MSM and Chondroitin also helps keep bone joints supple and promotes a healthy body. Apollo’s Angels Super Premium Pet Range are complete feeds manufactured from the very best ingredients. They are wheat gluten free, dairy free, hypo-allergenic, meat derivative free and contain only the highest quality meats. This means they are especially good for pets with allergies, wheat gluten intolerances, flaky skin or poor coat condition. Apollo’s Angels Grain Free Large breed Turkey, Sweet Potato & Cranberry is a complete, balanced and hypoallergenic pet food for adult dogs. Specially designed with larger kibbles for the requirements of a larger breed dog. This recipe has added Glucosamine, Chrondroitin Sulphate and MSM to help promote joint repair and mobility. Grain Free recipe dog foods are an excellent choice for dogs with grain intolerance or sensitivity. Apollo’s Angels Senior Grain Free Trout With Salmon, Sweet Potato & Asparagus is a complete, balanced and hypoallergenic pet food specifically formulated for older dogs. This senior dog food benefits from added Glucosamine, Chondroitin Sulphate and MSM to promote joint repair and mobility. Added salmon oil supports cognitive function, visual development and helps to reduce inflammatory response, especially important for joints. Apollo’s Angels Super Premium Pet Range are complete feeds manufactured from the very best ingredients. They are wheat gluten free, dairy free, hypo-allergenic, meat derivate free and contain only the highest quality meats. This means they are especially good for pets with allergies, wheat gluten intolerences, flaky skin or poor coat condition.